Always Accessorise, Even while Brushing. I have a new love in my life. It was love at first sight and we’ve been seeing each other for nearly a month now. Things are going great between us, every morning when I wake up and each night right before I go to sleep I am happy to see and use my Philips Sonicare DiamondClean. This tooth brush is the top of the line and rightfully so. It is beautifully designed, comes with many different cleaning settings and leaves my teeth looking and feeling better than ever. I spend more time rubbing my tongue across my smooth shiny nibblers than I do anything else these days. This should be enough of a recommendation to get you to invest in this toothbrush – but dear god the accessories are so fantastic and geeky I can barely contain my nerd jazz hands when I talk about them. First of all, the toothbrush comes with a very fetching glass to store it in while it is at rest in your bathroom. To charge the toothbrush, you pop the glass on a little silver pedestal and it does the business as if by magic. It must be black magic because it is by the the coolest and craziest charging method I have ever come across. But dear God wait there’s more! The toothbrush comes with a lovely hard case for when you’re traveling with it. It has a slot for the handle and two slots for your brush heads. Wait, what’s this USB mini port doing at the bottom of this end of the case? 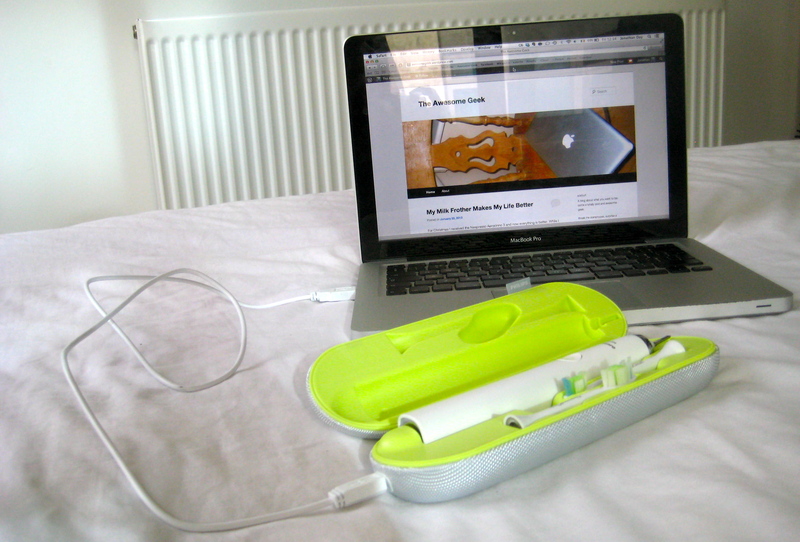 Shut the front door – you can charge your toothbrush via USB without even having to take the thing out of it’s travel case. I can’t handle this! Why doesn’t everything electronic have a mini USB port in it’s travel case? It makes so much sense! I can barely handle this toothbrushes genius anymore. Let’s talk about something else before I pass out from the brilliance of it all. This past Christmas I discovered the wonders of Etsy. I always knew the website existed and appreciated what it did for crafters but I never actually shopped on it. That is until I realised it is the best place to find gifts. I ended up getting to presents for a couple friends on Etsy, and of course I gifted myself something too. The Etsy shop is called hajimedesign and it is choc a bloc with incredibly charming ceramics that would be welcome to any home. I picked up the single bug porcelain vase. This is a tiny vase made for a single bloom or a tiny piece of flora. I have it currently sitting on my windowsill and I love plucking little bits when I’m out walking to display in it. I highly recommend this shop, they have great customer service. When I move to a bigger place I will definitely be investing in more of their designs. Visit their website for more info! This entry was posted in Geek, Handcraft, Health & Beauty, Technology and tagged Charging Glass, Diamond Clean, Electric Toothbrush, Etsy, Hajime Designs, HX9332, Japanese Porcelain, Oral Care, Philips, Sonicare, Toothbrush by Jonathan Day. Bookmark the permalink.